Swipe your bank card and get a new inner tube, next to a repair stand to help you change it. 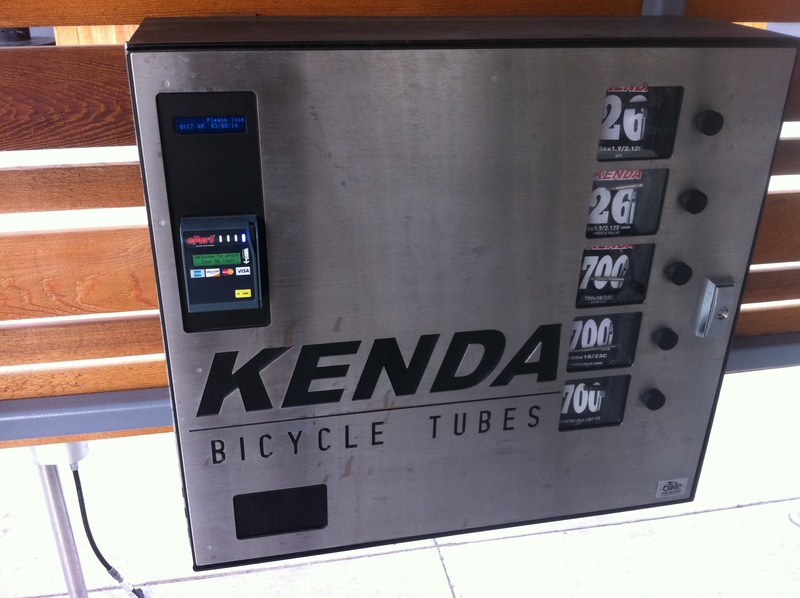 Mike Cobb sent me this photo of a vending machine outside the Green Zebra Grocery in Portland, Oregon, that sells Kenda brand bicycle inner tubes. These vending machines are more common in Germany and the Netherlands although I only spotted one in Berlin. A tube vending machine, Fahrrad schläuche in German, outside a bike shop in Berlin. He says they have a repair stand under shelter, air pump, tethered tools, and all-weather electricity outlets, too. “Yeah, I’ll shop there every time I’m within a 1/2 mile,” he said. Mike is busy planning Disaster Relief Trials around the country this year and we’re working to make one happen in Chicago. But we need a title sponsor who has thousands of dollars to donate. Mike in Seattle after winning DRT there. Photo by Fred Bretsch, FEMA Region 10. Is there a member of the ITE who will stand up against bad road designs? Sharing the road is one place to start. Why should one on a two-wheeled, muscle-powered device pedal along side a garbage truck with blind spots? Wait, why does an automobile even have blind spots? This enormous right-turn lane is one example of “dangerous by design”. Update October 5, 2012: For a great example on why I cannot – and why you should not – support bad road designs is this story of a fatal bike crash on a major biking “commuterway” in Chicago. We must stop building narrow bike lanes to the left of parked cars and we can be done with this type of crash for good. The infrastructure as we have it in Chicago and many other American cities cannot support any increases in bicycling. The operation and design of our infrastructure creates a finite limit for the number of people who will bicycle on it. I’m not talking about how many people can use it, but how many people want to use it. We’ve seen infinitesimal growth in the bicycle’s mode share for commuting to work, so small that the growth might not actually be growth at all because all the reported increases are within the range of error (the Census Bureau being the collector and distributor of the data). Our infrastructure is not safe, and that is what inhibits an increase in bicycling riders and trips that the City of Chicago, its mayor, its council, its officially adopted plans, and its people, desire. Until our roads are made safe, the cycle growth will remain minuscule or non-existent. The only other significant factor in promoting cycling is high gasoline prices, but even as they remain high, the cycle growth (or spike, seen in 2008) hasn’t returned. It’s a small group of people who are designing and maintaining our roads. And they are the first group of people we listen to when we say we want safe roads. Instead of the people who’ve actually built safe roads. The ITE is the Institute of Transportation Engineers, and, like many organizations, has a code of ethics. In their Canons of Ethics document (.pdf), there are at least two sections that require members to stand against bad road designs. Section 1: The member will have due regard for the safety, health and welfare of the public in the performance of professional duties. Section 11: The member will guard against conditions that are dangerous or threatening to life, limb, or property on work for which the member is responsible, or, if not responsible, will promptly call such conditions to the attention of those who are responsible. A study in Portland, Oregon, found that 60% of residents wanted to bike, but had concerns about safety. These residents are curious about bicycling. They are hearing messages from a wide variety of sources about how easy it is to ride a bicycle in Portland, about how bicycling is booming in the city, about “bicycle culture” in Portland, about Portland being a “bicycle-friendly” city, and about the need for people to lead more active lives. They like riding a bicycle, remembering back to their youths, or to the ride they took last summer on the Springwater, or in the BridgePedal, or at Sun River, and they would like to ride more. But, they are afraid to ride. They don’t like the cars speeding down their streets. They get nervous thinking about what would happen to them on a bicycle when a driver runs a red light, or guns their cars around them, or passes too closely and too fast. American roads are dangerous by design. It’s time to fire the people who design them that way. Year after year, roads in Chicago are ripped up, repaved, and restriped in exactly the same way that existed before. Miles of missed opportunities for safer roads. This essay says nothing of the lack of police enforcement of traffic rules, for which there is little empirical evidence. The essay may be updated from time to time, but I won’t be noting each change. An example of a better design: the buses and bikes don’t mix, and automobiles turning left cannot be passed by through-automobiles. Bicyclists are safer. My favorite photo from my first (and only) trip to Portland, Oregon, in April 2010. I covered this event for a Streetsblog article (which has been delayed). Essentially the Bikes Belong Foundation and its donors are trying to get “better bike lanes” (Euro-style) installed faster across North America. It’s more of a strategic planning thing; the money isn’t going to be used for paying for construction of the bike lanes. It’s about knowledge sharing and technical assistance and documenting the process. Eventually this knowledge will be shared with all cities in the whole country. But essentially, Austin, Texas, can use this network to be able to get some help from Chicago or San Francisco, without incurring on those cities’ ability to quickly get their own lanes in. See all photos from the soirée and then the next day’s press conference (Wednesday, May 30, and Thursday, May 31). I am somewhat impressed that the director of the Federal Highway Administration*, Victor Mendez, pictured above, came from Washington, D.C., to tell us about the federal government’s support for bike lanes. I wish he could have said the same thing about House Republicans’ support. They’re against transit, too. I asked Victor to tell transportation secretary Ray LaHood to read Grid Chicago. Watch this video by Nick Brazinsky. I believe he was hired by Bikes Belong to shoot it. That he roller skates to take video makes the film a little cooler. * The FHWA administers bike lane funding, as well as funding for roads and highways. They are in charge of the CMAQ, Congestion Mitigation and Air Quality, funding program. Well, if I had to choose, it’s the WorkCycles Fr8. It can carry stuff so that I don’t have to carry it on my person, thus hurting my body. Carries in such a way so as to not negatively affect the handling and maneuverability of the bike. Can be ridden by a variety of person sizes (I’m not sure if this represents utility, not 100% sure on this one). Photo by Jonathan Maus of BikePortland. Read his reporting on the topic. Oregon Manifest judges chose the winning bike on Friday, September 24, 2011, and it’s far from being the ultimate utility bike. Tony’s bike – centered around an electric pedaling assist — was specifically designed to get people out of cars, introducing amenities that drivers have grown accustomed to on the road; stereo, locking storage, stable loading and a huge dose of Fun Factor. There was a palatable pause as the first place winner for the Ultimate Utilitarian Bike was announced at the the 2011 Oregon Manifest awards. The pause was long enough to register as a pause. A stop. It was uncomfortable. Clearly people everywhere in the crowd were saying, “What the hell?” I looked around and saw other people looking around. There was some confusion. The wide front rack is mounted to the steering and thus will make maneuverability difficult. The double-leg kickstand is not very wide. The drivetrain is exposed, it uses electrical parts that will fail or need maintenance that many people will not be able to provide. The high top tube may make it difficult for some to mount the bicycle. I do love the locking storage, though! From Paul Johnson on BikePortland.org. Photo of drivers straddling the streetcar tracks and impeding the bike lane, in Lovejoy Street in Portland, Oregon. Update: This post has been widely shared. I suspect other people have blogged about their experiences of taking bikes on Amtrak. Leave a comment with the link, or tweet or email me, and I will include a link to your blog on this page. My friend, Will Vanlue, from Portland describes his experience taking a bicycle on Amtrak to Seattle. He bought a bicycle ticket even though he was pretty sure folding bikes could be brought on as carry-on luggage. It was true and the Amtrak staff refunded him. Like some light rail trains, Amtrak Cascades cars have vertical storage for full-size bicycles. Travis was able to get his Bullitt “Long John” cargo bike on the train with assistance from the staff. The Amtrak Cascades train spoils their passengers compared to those on the Hiawatha or Wolverine, offering a power outlet for every seat, and free wifi. I took the train in April 2010 on my trip with Brandon to Portland and Seattle. This is a good time to bring up, again, that Michigan trains will soon offer “roll on” bicycle service to passengers in 2012. A curb and ADA-accessible ramp in Pilsen neighborhood of Chicago, Illinois. The City of Chicago, as part of a lawsuit, agreed to renovate thousands of curb cuts across town that did not meet the standards of the Americans with Disabilities Act of 1993. This particular location was more involved than others because of the real brick crosswalk. It had to be removed and then replaced after the level of the street was raised. In a long walking tour of Portland, Oregon, with PBOT worker Greg Raisman, we came across my first ever mountable curb. It’s a raised part of the street and motorists in small vehicles will probably avoid driving on it. It was installed because this is part of a truck route and it’s easy for truck drivers to roll on top of it without driving on the sidewalk. A typical bumpout or curb extension, as seen in Tucson, Arizona. This design is not unique to Tucson, but I point it out because this one comes with accompanying signage telling people bicycling and driving that they must stop when they see a person trying to cross the street. An atypical situation in San Francisco, California, (not the tracks, but the way the tracks terminate in a mound of danger) that I hope gets corrected right away. In downtown San Francisco, there are very wide crosswalks made with colored stone that sets it apart from the rest of the roadway. But the sidewalk ramps are still very narrow. Also, granite curbs are more slippery than concrete. This all just seems like a bad situation, but it looks pretty. I have it on good authority that Julius Caesar was at the curb dedication ceremony here in Milan, Italy, and saw far into the future people chatting about bicycles on the sidewalk. Curbs in Amsterdam, Netherlands, play a vital role in a calm and managed all-mode transportation system. Here the curb is a ramp up onto the sidewalk and separated bike lane that leads into a neighborhood street. Mounting the curb should signal to the driver that they are entering a different space that has different rules and responsibilities. UPDATE: With the post you’re reading and this post, I want to show you what a bicycle lane can do! Also clarified definition of buffered and protected bike lanes in second paragraph. All of this talk about protected bike lanes made me want to watch some videos! Here’s a clip of my friend and I riding on our first ever buffered bike lanes. As seen on Stark Street in downtown Portland, Oregon. The next video is about Sands Street (over 1 year old now) in New York City that I’ve been raving about for a couple weeks and months now, since riding on it in late August 2010. One half is protected by a concrete wall, and the other half is semi-protected by having raised pavement and a buffer. A bike lane with only a spatial buffer is not considered protected (like in the first video, above). People riding their bikes westbound (right side of bike lane) on Sands Street toward either the Manhattan Bridge (turn left, south), or Dumbo Brooklyn and the waterfront (turn right, north).